Home News Which Side Is Your Fuel Filler Cap? Which Side Is Your Fuel Filler Cap? We recently received an e-mail containing the below info and though that it would be a good idea to share it on our website. We all have been driving for many years… I would think I should have noticed the little secret on my dashboard that was staring me in the face the whole time…I didn’t…and I bet you didn’t either…. Have you ever borrowed a car and when arriving at the gas station wondered…mmm, which side is the gas filler cap? My normal solution was to stick my head out the window, strain my neck and look, try to see in the side mirrors or even get out of the car! Well ladies and gentlemen, I’m going to share with you my little secret so you will no longer look like Ace Ventura on your way to the gas station or put your neck at risk of discomfort or injury. If you look at your gas gauge, you will see a small icon of a gas pump? The handle of the gas pump will extend out on either the left or right side of the gas pump? If your tank is on the left, the hose will be on the left? 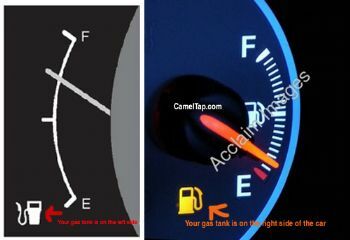 If your tank is on the right, the hose will be on the bottom (see photo). It is that simple!